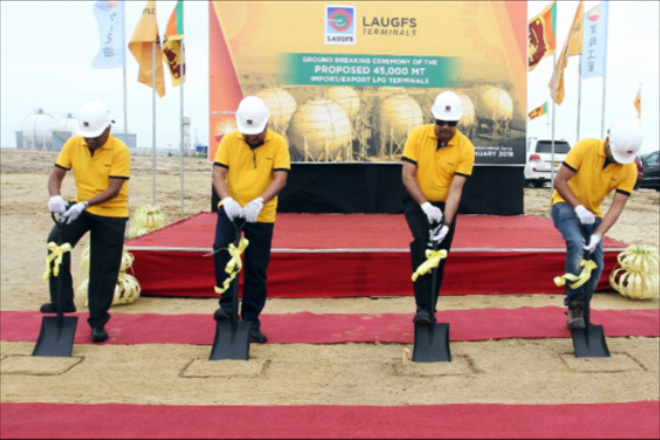 LAUGFS Terminals Limited joined together with China Huanqiu Contracting & Construction Corporation (HQC) to officially break ground for the 45,000MT LAUGFS LPG Import/Export Terminal at Hambantota Port, with a massive investment of over USD 80 million allocated for the project. The Terminal will be the first step in building a regional energy distribution hub in Sri Lanka, drawing in from the Hambantota port’s unique location-specific advantages. It will bring in tremendous benefits not just for the local LPG industry, but also for the country’s economy through many lucrative revenue and employment opportunities. As one of the largest LPG Terminals in South Asia, the LAUGFS Terminal will also deliver significant cost advantageous to regional LPG break bulk markets and will position Sri Lanka as a central energy distribution hub with access to some of the largest emerging LPG markets in the world.